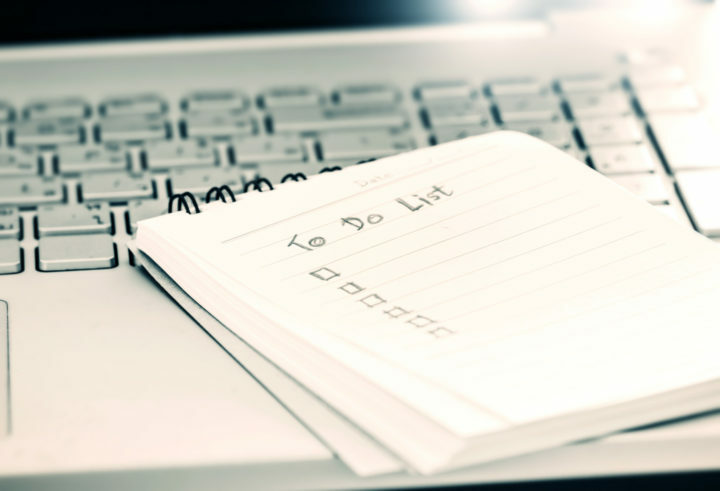 How well does your to-do list work for you? Anytime the topic of productivity comes up, the conversation likely will turn to managing projects and tasks. We’re always looking for tools and systems and tips for managing all the stuff we need and want to do–we’re always hoping we’ll find something that’ll make it easier and less overwhelming. In this episode I share some thoughts on making the most of your to-do list and ways to make it a more useful tool. Choose a format you like, and decide to make it work. Your to-do list can be digital, paper, bullet journal, 3×5 cards, back of an envelope, or a premade planner. Whatever works for you is fine. Sometimes we think everything will change if we just find a different planner or system. It’s not the system or tool you use, though; it’s how you use it. Find something you like the look of, the feel of, and the approach to, and don’t second-guess your choice. Choose something and then commit to sticking with it and using it consistently for at least three months. Whatever to-do list tool you choose, you need to develop the habit of using it consistently. This means you need to have it with you at all times — whether it’s a notebook, an app on your phone, or a stack of 3x5s in your pocket or purse. This is why I like OmniFocus. I have the app on my Macs, my iPhone, my iPads, and they all sync, so wherever I am, when I think of something, I can add it (even dictate it) and it’ll show up everywhere. If you prefer a paper-based system–a premade planner or a bullet journal, for example–you can do the same thing: make sure you keep it nearby where you can add to it and consult it regularly. That's how you make sure nothing slips through the cracks. Bottom line? Choose a system or tool that works with the life you have (not the life you wish you had), and always keep it with you. Put everything in it. You won’t have peace of mind if you’re trying to remember even one or two things. Some people say, “I did that, and now I have so many things to do!” But remember — You don’t actually have to do all those things, and all those things were in your brain anyway, distracting you and using mental energy. By getting them out of your head into a trusted system, you let your brain rest and you give yourself the ability to evaluate them rationally and discard them if you want to. A task manager works best if everything you need to do is in there. Develop the habit of checking it regularly until it becomes a habit. Set a routine time to check your to-do list, and set an alarm if you need to until it's become a habit. Throughout the day, when you finish a task, check your list and see what’s next on your list. Make checking your list part of your morning and end-of-day ritual. Do what it takes to make sure you're paying the proper amount of attention to the list so that nothing gets overlooked. Don’t fill it with more than a human being can do. Build some margin in your day. Make sure your to-do list is filled with tasks, not projects, as we discussed in episode 130, “What’s On Your To-Do List.” Remember to break your tasks down into the smallest possible components. When you write a task on your list, start with an action verb. Not “closet” but “clean closet” (except that’s a project! ), and remember to be specific and realistic. The tasks on your to-do list should reflect your priorities; your to-do list should include tasks that will move you forward on your goals, and not just the mundane things that need to be done. If you have a lot of tasks, consider having a separate list where you just braindump everything that’s on your mind, and then your regular to-do list for day-to-day. The second list is comprised of task you pull from the first list for a specific day. Digital task managers let you do this all in one place. For example, you can dump everything into the “inbox” so everything is there. Then you process items in the inbox by adding tags (separate for work, home, personal, hobby, assigning dates, etc. ), that let you see only what you want to see on a given day. You can do the same thing with paper task managers, such as a planner for the all-in capture, and a 3×5 card for the tasks for the day. I use my bullet journal for this. In my spread for each day I list the 3-5 things I’m going to do that day; those are pulled from my master project/task list in OmniFocus. Consider having what David Allen calls the “Someday/Maybe” list. This is a place to capture those projects and task that you might want to do someday, projects that you don't want to commit to doing now, but you don't want to forget until you have time to decide. If you use a digital task manager, you can create “someday” tag to mark those items. Make sure this list is included in your regular review time; during your review, look at each item on the list and decide whether to move each one to your “active projects” list, or defer it, or delete it. Follow the steps for using the to-do list, and remember they should be separate steps. Capture: Capture the ideas and tasks as they come to your mind. You don’t have to sort and tag tasks when you enter them. You can just have a place to put them until the time you’ve set aside to process them. Every digital task manager has an “inbox.” If you use paper, you can use a physical inbox or a page in your notebook that’s just for jotting notes as you think of them, and then during the time you’ve set aside for the next step you can decide where they go (or if you even want to keep them). Process: When you have scheduled time for processing you then organize and prioritize and schedule. Sort them into the categories that make sense to you. Do: Actually make a plan for completing your tasks. Review: Set regular times to review what’s there, and confirm that nothing is slipping through the cracks. This is how you know you can trust the system. Having a list won’t create any progress unless you schedule time to actually do those things. When something’s on your to-do list for a particular day, note when you’re going to do it. If it’s important, put time on your calendar to work on it. Make it concrete. You don’t need to schedule everything, but if it’s important, consider scheduling an appointment with yourself to get it done. With that in mind, we also need to make sure we don’t set phony deadlines, and honor the commitments we’ve made to ourselves. There's no magic wand that will make it permanently simple and easy to get all our stuff done, but there are some things we can do that’ll make it less overwhelming. What do you use for a to-do list, and how’s it working for you? I'd love to hear your ideas. Leave a comment below or in The Productive Woman community Facebook group, or email me. Are you looking for support, ideas, and encouragement as you pursue your goals? Would you welcome someone to come alongside you in your journey to making a life that matters? My greatest privilege is working with women to clarify, strategize, refine, and accomplish their goals. Check out the Work with Me page for more information about The Productive Woman Mastermind groups and personalized one-on-one productivity coaching. I'd love to work with you! If you're not already there, join us in The Productive Woman community Facebook page to continue the conversation.